﻿ Bob Evans Restaurant at the Farm - Ohio. Find It Here. 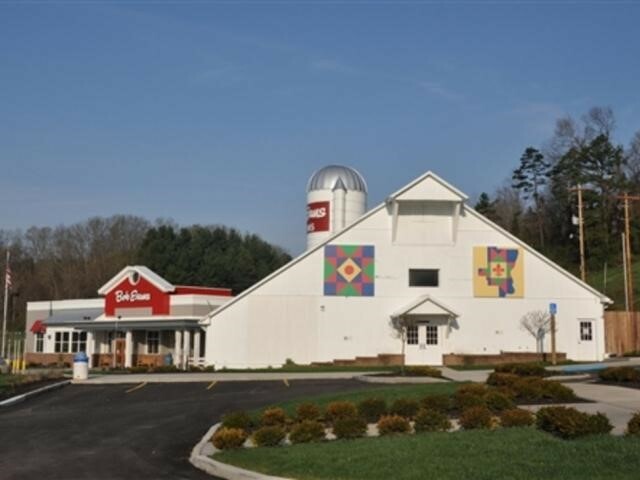 Bob Evans, founder of our company, lived on the Bob Evans Farm in southeastern Ohio for nearly 20 years. He and his wife, Jewell, raised their six children in the large brick farmhouse known as the Homestead. Now on the National Register of Historic Places, the Homestead was once a stagecoach stop and an inn. Later, the Evans family opened The Sausage Shop in their front yard, which later became the first Bob Evans restaurant, still open today. The spirit of hospitality is deeply embedded in our company's history. Today, the Homestead serves as a company museum and historical center.The Farm also has many beautiful sites for visitors to explore  an old cistern where stage coach travelers watered their horses, an ancient Indian burial mound, a Revolutionary War cemetery where original settlers of the area are interred, several reconstructed historic cabins and a schoolhouse and lovely views of Raccoon Creek. The area is rich in history  across Raccoon Creek is a cave where Daniel Boone reportedly slept. Visitors may also enjoy a horseback ride on one of the propertys trails.The Bob Evans Restaurant, located on Farm property, is open all year round. The Farm and Homestead Museum are open daily May 1 through October 31, 10:00 a.m. to 4:00 p.m.